Smoothie,,, with fruit is one of my all time favorite drinks. I love to have chickoo fruit smoothie though I don't like to eat ripe chickoo fruit. Here am going to share with you an easy dessert with ripe chickoo and ripe mango or ripe papaya. The best easy recipe for a rich creamy dessert. 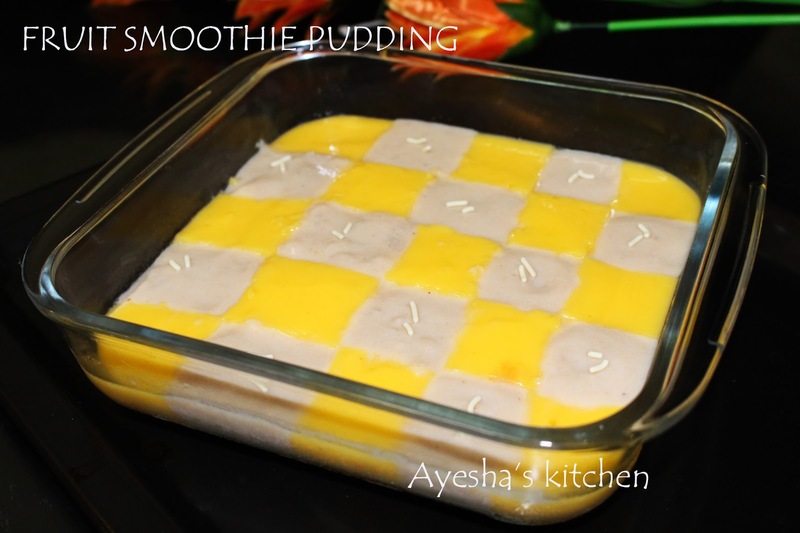 The ripe mango and chikku combo make this smoothie pudding luscious. And the way I presented makes this pudding very special. I just planned to make a mixed smoothie only. But later I put my hand and mind on this variety party pudding... a pudding with two different fruits .Am very happy that I made this chess board pudding and it turned out very very well....Do try and let me know the feedback. Prepare smoothie with mango or papaya. Combine together mango (peeled and chopped),more than quarter cup condensed milk, sugar and half a cup of chilled milk. Blend in a mixer till the mixture is smooth and frothy. Set aside. Now boil 8 gms of china grass with a cup of water in a pan until it melts to a clear liquid. Meanwhile heat the mango smoothie mixture. When chinagrass is done, pour it to the prepared mango smoothie mixture through a strainer. Let it cook for 2 minutes and transfer it to the pudding tray. Let it keep refrigerated until firm. Approximately 1 hours. After one hour, prepare chikku smoothie. Combine chikkoo(peeled and chopped),condensed milk, sugar and less than half a cup of chilled milk. Blend in a mixer till the mixture is smooth and frothy. Set aside. Now boil this smoothie mixture and add cornflour paste ( mix cornflour with some water) . You can also make the chikoo pudding using chinagrass for a perfect slice. But I prefer slightly creamy chikoo pudding than a stiff slice. When it turns thick, remove from flame. Now cut the mango pudding into small squares. Keep stirring the chickoo smoothie, else it will harden. Remove the alternative squares of mango pudding and pour chikkoo smoothie in that gap. Do not take the alternative squares at a time. 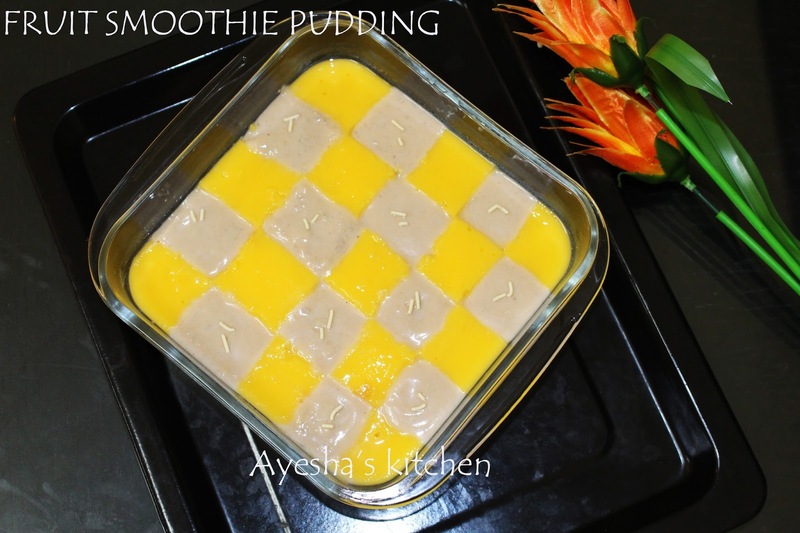 Take a mango square pudding and then pour the chikkoo smoothie in that gap and then take the next alternative and so on. When done, refrigerate until set.